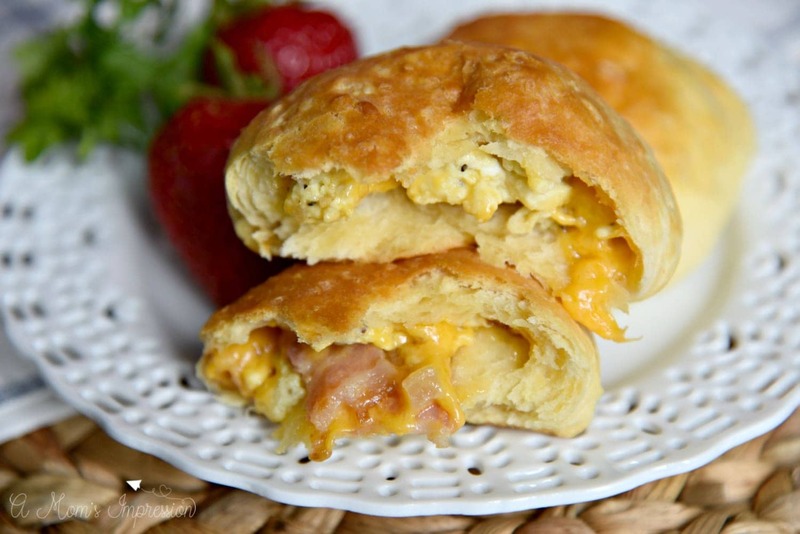 This Bacon, Cheese and Egg Kolache recipe is delicious and perfect for breakfast. 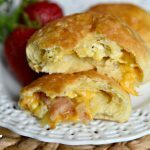 This version is a simple take on the traditional Czech recipe using premade biscuit dough and featuring Smithfield Bacon. Thank you to Smithfield for sponsoring this post. My kids have been in school for three weeks now and I have to admit, I am already trying to find some good breakfast recipes that we already haven’t eaten a billion times. Research shows that when kids enjoy a hearty and wholesome breakfast in the morning, they are more likely to perform better at school and on standardized tests. Getting them started every morning with a good breakfast like this morning kolache recipe is important. One in six American children struggle with being hungry. Smithfield is partnering with No Kid Hungry for the second year in a row to ensure students are getting the nutrition they need in the morning to start off their school day. This year they are doubling their donation to two million meals to support No Kid Hungry’s in-school breakfast programs. We would love your support. Smithfield and I are encouraging you to get involved by making a Smithfield breakfast and sharing a photo of it on your social media account using #BreakfastPower. We hope you can encourage your family and friends to also get involved so we can help provide 2 million meals to hungry kids. Visit Smithfield’s website to learn more. The star of this morning kolache is the Smithfield Hometown Original Bacon. Smithfield’s breakfast portfolio products will give your kids the protein boost they need in the morning for adequate energy until it’s time for lunch. 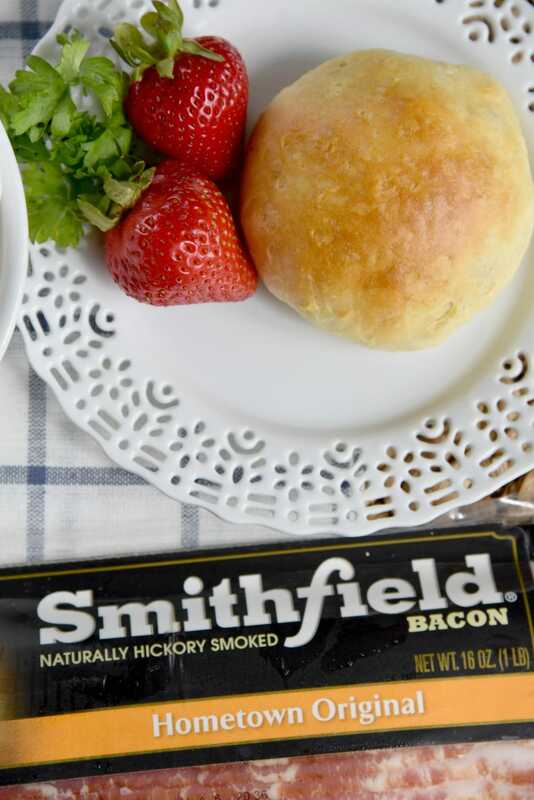 Smithfield Bacon is delicious with just the right amount of smoky flavor. It is great if you like your bacon crispy or chewy, and makes any of your favorite breakfast dishes even better! This bacon is good, so good I would eat it for dessert! 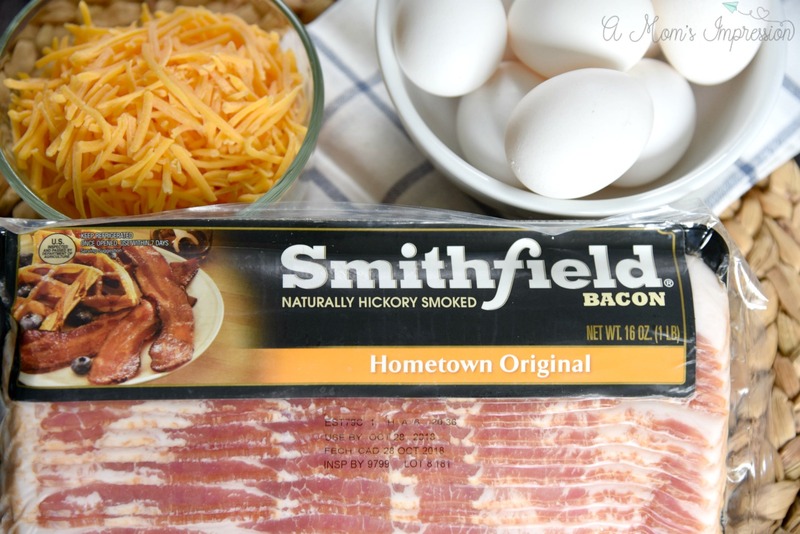 Smithfield bacon comes in a wide variety of flavors and cuts, like Cherrywood, Thick Cut, and the classic Hometown Original. We used the Hometown Original variety for this kolache recipe. You can find it at your local grocery store. A kolache is a traditional Czech pastry that is filled with a sweet (usually fruit) or savory filling. Most kolaches are made using a sweet dough and are served warm. There are many different variations of this bakery dish are they are becoming more and more popular here in the United States. 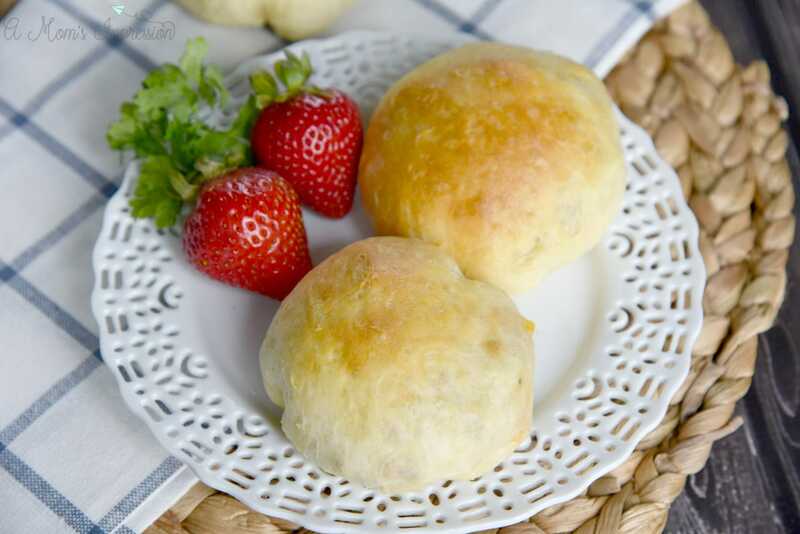 A kolache is made by taking a pastry or biscuit dough, flattening it out, filling it with a savory or sweet mixture and wrapping the dough around the filling. The pastry is then baked and enjoyed warm. 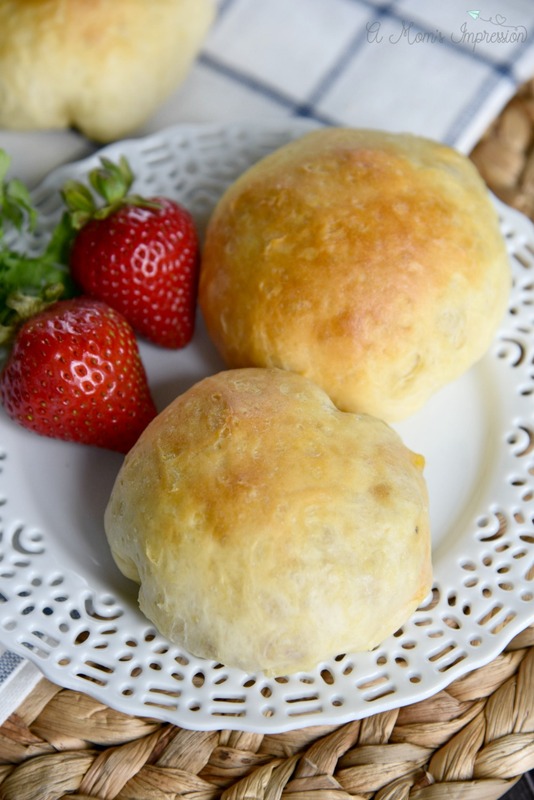 I have created a very simple version of the kolache using a premade biscuit dough for a quick breakfast option for our busy mornings. For a time-saving tip, I will usually bake the Smithfield bacon in the oven the night before. You can also make these the day before as they reheat in the morning easily. Place bacon on a foil-lined baking sheet and place into a cold oven. Heat oven to 350 degrees. When the oven is preheated, take the bacon out and flip over, drain grease, and place back into the oven until crisp, about 8 more minutes. Place bacon on paper towels to cool and then dice into bite size pieces. While bacon is baking, heat oil in a medium sauté pan and cook onions until caramelized. Combine milk, eggs, salt, and pepper in a mixing bowl and scramble. Cook eggs until done. 4. 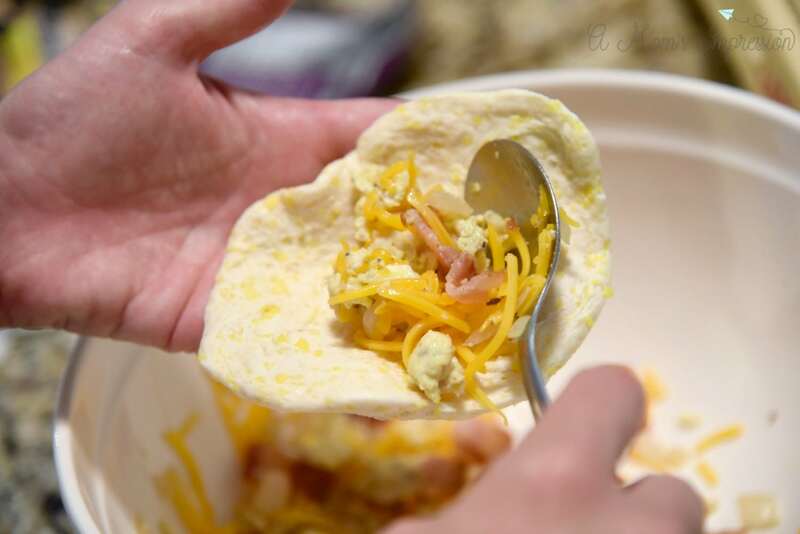 Combine eggs, onions, cheese, and bacon in a medium mixing bowl. 5. Open biscuits and spread the dough flat using your hands. 6. In the middle of each biscuit, place about two tablespoons of filling in the center. 7. Fold the biscuit dough up over the filling and pinch together to form a ball. 8. Place seam side down in a buttered casserole dish. 9. Bake at 375 degrees for 15-18 minutes until golden brown. 10. Brush tops with melted butter. Scroll to the bottom of this post for a printable recipe! 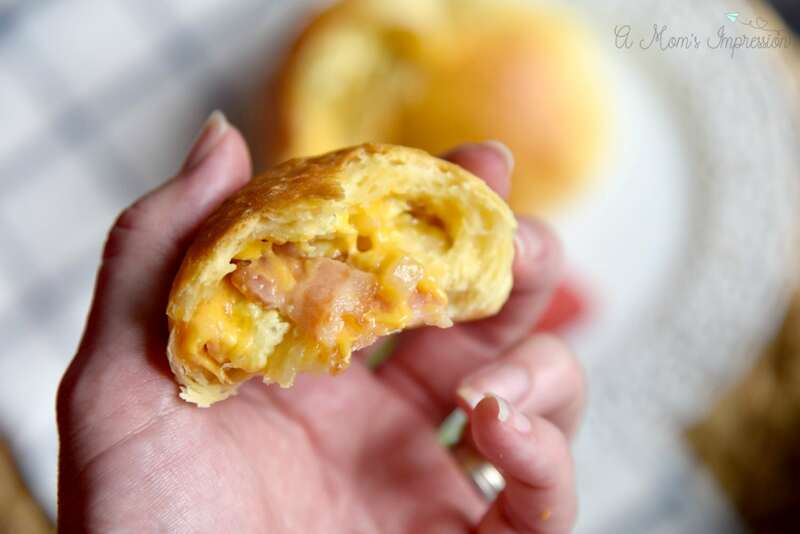 This bacon, cheese and egg kolache recipe is delicious and perfect for breakfast. This version is a simple take on the traditional Czech recipe using premade biscuit dough. While bacon is baking, heat oil in a medium saute pan and cook onions until caramelized. 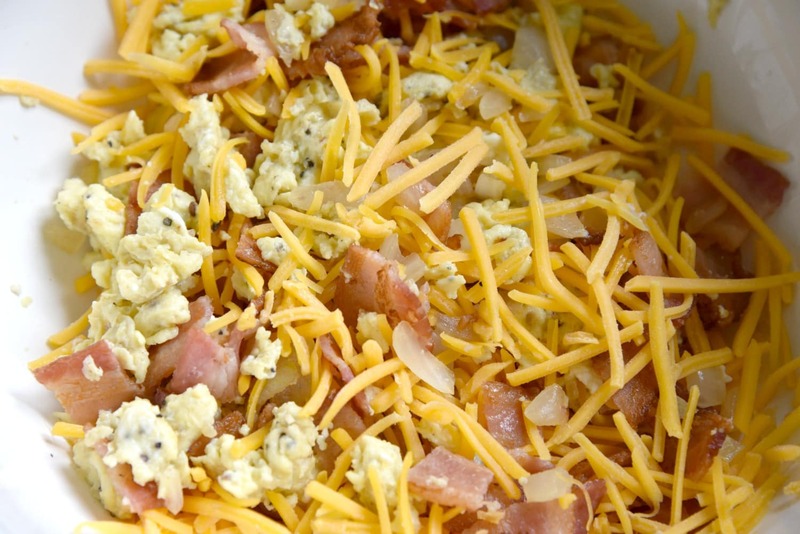 Combine eggs, onions, cheese, and bacon in a medium mixing bowl. Open biscuits and spread the dough flat using your hands. In the middle of each biscuit, place about two tablespoons of filling in the center. Fold the biscuit dough up over the filling and pinch together to form a ball. Place seam side down in a buttered casserole dish. Bake at 375 degrees for 11-15 minutes until golden brown.